er-h: Another Visual Metaphor––When Is Something Really Something Else? Another Visual Metaphor––When Is Something Really Something Else? I watched a documentary recently called California Typewriter and found myself drawing typewriters for a few days afterwards. This was one of the ideas that popped up. I never owned a Selectric but always found the orb-shaped cartridge interesting. It seemed illogical (the gyrations required seemed overly elaborate)––but in use it proved very logical. 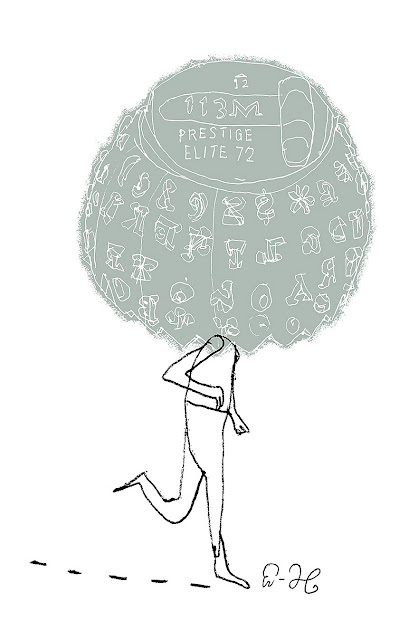 It squeezed a complex sorting of letters into a very compact package, the most elegant of compact packages, the orb. It functioned in spite of itself. Sort of like the weird idea FedEx had of sending packages from New York to New Rochelle via Memphis. The central clearing house idea. It seemed cockeyed until it simplified the process. This is the key difference between direct representative illustration and metaphorical, idea-based illustration. A drawn metaphor works best if it remains simple, even blunt or crudely rendered. Not obvious or explicit. The more it looks like the image drawn the less likely it will suggest the idea or thing it's being compared to. This drawing (above) would be a more successful metaphor if the Selectric orb were dropped into a planetary system, if it were revolving around the sun, for instance, or if it were being passed from player to player like a basketball. That said, I like the oddity of this running figure. I don't know what it means. That is what sketchbooks are for. For now I'm storing that drawing of the Selectric orb in this collage and may use it elsewhere someday.